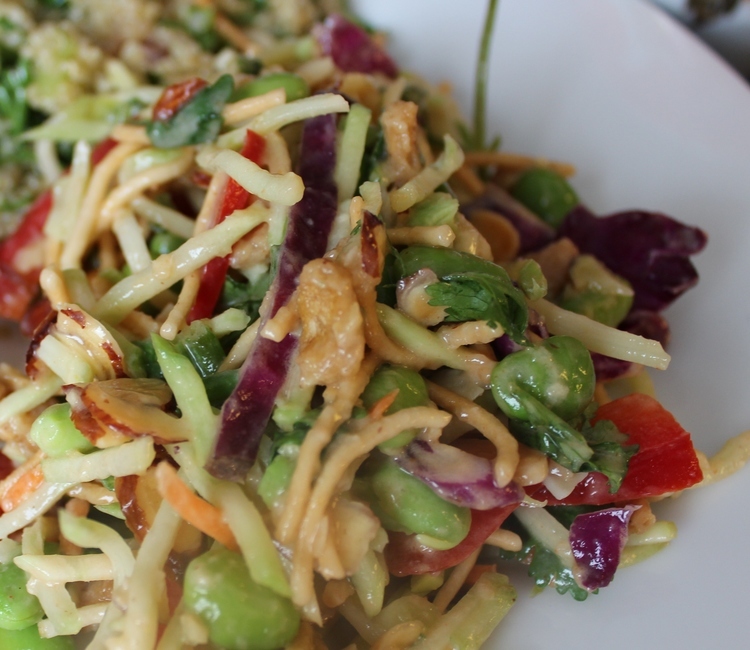 This Asian Broccoli Slaw with Peanut Dressing is so easy to make and delicious and healthy. I made it for a lunch with girlfriends and served it with Teriyaki Salmon, Mediterranean Salad and Pumpkin Soup. Many recipes for asian coleslaw are made with regular cabbage but I decided to make this one with broccoli slaw mix. I used almonds, edamane, red peppers, cilantro and the crunch package that came with the broccoli slaw mix. If you are trying to go gluten free then leave out the crunch package. ASIAN BROCCOLI SLAW WITH PEANUT DRESSING. YUMMY! The vitamins are very high in this Asian Broccoli Slaw with Peanut Dressing and you can certainly eat it alone as a main course. The nuts both almonds and peanut dressing and the edamame are high in protein and fiber. The broccoli alone will give you over 50% of your vitamin C needs. Combine all of the slaw ingredients in a large bowl. Make the dressing by combining all of the ingredients in a medium bowl. Stir or mix in a blender until the peanut butter is dissolved and the dressing is smooth. Add the dressing and toss well. Let sit at least ten minutes so vegetables have a chance to soak up the dressing. Taste and adjust seasoning if necessary. Serve cold. (This recipe was adapted from “Once Upon a Chef”.